Emmanuel Macron and Recep Tayyip Erdogan in Jan 2018. Image source: AFP via Getty images. On the same day that Trump made his unexpected announcement that US troops would be “coming out of Syria very soon,” French President Emmanuel Macron reportedly pledged to send a French military force into northern Syria in support of US-backed Kurdish forces near Afrin – now under Turkish control. 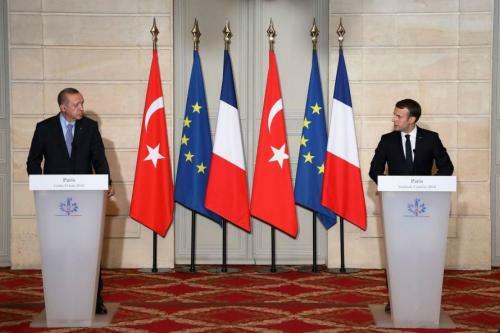 News of Macron’s promise to Kurdish officials in a closed door meeting was met with a swift and harsh response from Turkey: “If it’s accurate, the statement on mediation between Turkey and SDF amounts to crossing the line,” President Recep Tayyip Erdogan said on Friday. “Those who yesterday hosted terrorists at the highest level once again should know this is only an expression of enmity against Turkey,” Erdogan added, essentially calling France a ‘state sponsor’ of terror. Though the French Presidency did not immediately confirm the news Thursday, reports circulated widely after Macron met with a delegation of Syrian Kurdish officials on Thursday representing the self-declared autonomous region of Rojava, of which the Syrian Kurdish People’s Protection Units (YPG/YPJ) are the prime defense forces on the ground. Such an expansion would undoubtedly put Turkish troops and Turkey’s proxy FSA forces face to face with US-backed forces – as Syrian Democratic Forces (SDF) are present in both places. Days after Erdogan’s speech on Sunday, Turkish forces began clashing with SDF fighters in Tal Rifaat, in the northern Aleppo countryside – thus it appears the Turkish president is making good on his promise. An unidentified number of French troops will be deployed “very quickly,” Macron assured the Rojava delegation, according to a Kurdish representative who attended the meeting. Multiple reports identified the initial deployment of French troops to northern Syria as special forces – though it’s likely that French special forces who are already present in the region or in Syria itself would simply be relocated to take a more direct advisory role alongside the Kurdish YPG and SDF. “The president … paid tribute to the sacrifices and the determining role of the SDF in the fight against Daesh,” Macron’s office said in a statement. Macron has been seen as less hawkish regarding France’s Syria policy, which recently led former president Francois Hollande to level the accusation of Macron’s abandoning the Syrian Kurds. Meanwhile, Turkey’s National Security Council on Wednesday repeated Erdogan’s prior threats that Ankara would “take action” to eradicate all Syrian Kurdish groups from northern Syria. With Trump pledging to withdraw all US troops from Syria “very soon” it appears that France and other coalition allies are declaring their willingness to step in and replace US occupying forces in Syria. Trump’s initial announcement of US troop withdrawal came the same day two US coalition soldiers were reported killed in Syria (overnight Thursday). According to early reports, confirmed by the Pentagon, an American & British soldier were killed by an improvised explosive device in Manbij where US personnel are stationed. With this news and with Turkey’s latest bellicose rhetoric aimed at France, Macron is likely already second-guessing his willingness to jump straight into northern Syria’s quagmire of actors just as the US may be in the process of exiting.